Many smokers enjoy smoking, but also want to give up. If this sounds like you, the thought of stopping smoking all at once won't be particularly appealing. That's where NiQuitin Minis come in. By helping you quit one cigarette at a time, they help you quit at your own pace and on your own terms. NiQuitin Minis are small, mint-flavoured nicotine lozenges that starts to work in 3 minutes. When you feel like having a cigarette, simply try having a Minis instead and you can gradually reduce the amount you smoke. Which NiQuitin Minis is for you? 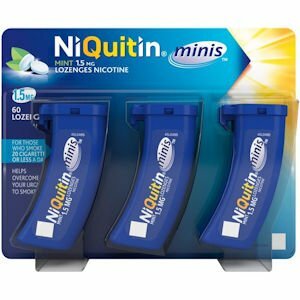 If you smoke 20 cigarettes or less a day then the 1.5 mg NiQuitin Minis is for you. 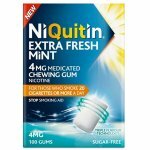 If you smoke more than 20 cigarettes a day then go for the 4 mg NiQuitin Minis. With NiQuitin Minis, you can stay in control and quit one cigarette at a time. The strength of lozenge to be used will depend on the smoking habits of the individual. 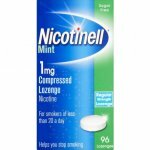 NiQuitin Minis Mint 4 mg and 1.5 mg Lozenges are suitable for smokers who smoke more than 20 cigarettes a day. One lozenge should be placed in the mouth and allowed to dissolve. Periodically, the lozenge should be moved from one side of the mouth to the other, and repeated, until the lozenge is completely dissolved (approximately 10 minutes). The lozenge should not be chewed or swallowed whole. Users should not eat or drink while a lozenge is in the mouth. Behavioural therapy advice and support will normally improve the success rate. Users should make every effort to stop smoking completely during treatment with NiQuitin Minis Mint 4 mg and 1.5 mg Lozenges. Use the lozenges whenever there is an urge to smoke. Sufficient lozenges should be used each day, usually 8-12, up to a maximum of 15. Continue use for up to six weeks to break the habit of smoking, then gradually reduce lozenge use. When daily use is 1-2 lozenges, use should be stopped. To help stay smoke free after treatment, users may take a lozenge in situations when they are strongly tempted to smoke. Those who use lozenges beyond 9 months are recommended to seek additional help and advice from a healthcare professional. Use a lozenge whenever there is a strong urge to smoke in order to reduce the number of cigarettes smoked as far as possible and to refrain from smoking as long as possible. The number of lozenges a day is variable and depends on the patients needs. Nonetheless it should not exceed 15 lozenges per day. If a reduction in cigarette consumption has not been achieved after 6 weeks of treatment, a healthcare professional should be consulted. Reduced tobacco consumption should lead to complete cessation of smoking. This should be attempted as soon as possible. When the number of cigarettes has been reduced to a level from which the user feels able to quit completely, then start on the schedule for "abrupt cessation" as given above. Use a lozenge every 1-2 hours to control troublesome withdrawal symptoms including craving. Users should not take more than 15 lozenges per day. Users should be encouraged to stop smoking completely as soon as possible. If users are still feeling the need to use the lozenges on a regular basis 6 months after the start of treatment and have still been unable to undertake a permanent quit attempt, then it is recommended to seek additional help and advice from a healthcare professional. Adolescents (12-17 years) should follow the schedule of treatment for abrupt cessation of smoking as given above, but restrict use to a maximum of 12 weeks duration. If longer treatment is required, or where adolescents are not ready or able to stop smoking abruptly, advice from a healthcare professional should be sought. Safety and effectiveness in children who smoke have not been evaluated. NiQuitin Minis Mint 4 mg or 1.5 mg Lozenges are not recommended for use in children under the age of 12. The risks associated with the use of Nicotine Replacement Therapy (NRT) are substantially outweighed in virtually all circumstances by the well established dangers of continued smoking. Should be encouraged to stop smoking with non-pharmacological interventions. If this fails, NiQuitin Mint or Original Lozenges may be considered, but as data on safety in this patient group are limited, initiation should only be under medical supervision. Once patients are discharged from hospital they can use NRT as normal. Patients with diabetes mellitus should be advised to monitor their blood sugar levels more closely than usual when NRT is initiated as catecholamines released by nicotine can affect carbohydrate metabolism. Use with caution in patients with moderate to severe hepatic impairment and/or severe renal impairment as the clearance of nicotine or its metabolites may be decreased with the potential for increased adverse effects. Use with caution in patients with uncontrolled hyperthyroidism or phaeochromocytoma as nicotine causes release of catecholamines. Swallowed nicotine may exacerbate symptoms in patients suffering from oesophagitis, gastric or peptic ulcers and oral NRT preparations should be used with caution in these conditions. Ulcerative stomatitis has been reported. Doses of nicotine tolerated by adult and adolescent smokers can produce severe toxicity in small children that may be fatal. Products containing nicotine should not be left where they may be misused, handled or ingested by children. Polycyclic aromatic hydrocarbons in tobacco smoke induce the metabolism of drugs catalysed by CYP 1A2 (and possibly by CYP 1A1). When a smoker stops this may result in a slower metabolism and a consequent rise in blood levels of such drugs. Transferred dependence is rare and is both less harmful and easier to break than smoking dependence. NiQuitin Mint or Original Lozenges contain a source of phenylalanine equivalent to 3mg/dose. May be harmful for people with phenylketonuria. Each NiQuitin Mint or Original Lozenge contains 15 mg of sodium. People on a low sodium diet should take this into account.